“Go West, young man” was a phrase used by 19th Century newspaper editor Horace Greeley to encourage America’s youth to seek opportunity on the western frontier. On April 28 and 29, Terri Gerber, HR Generalist, Laura Karels, Designer, and I will be meeting with students at the Cal Poly Graphic Communications (GrC) Career Day to help them see how they can “Head East” to use their graphics skills in the direct marketing industry. While 2016 will mark our first appearance at the Cal Poly GrC Career Day, we have a history of participating in college career fairs directed at students of various majors. What makes the GrC Career Fair different is that it’s an industry-specific event; it’s attended by students majoring in Graphic Communications who express interest in using their design and graphic arts skills in marketing. These students have a solid understanding of the print production process, which can give them a head start in understanding direct marketing. Cal Poly’s Career Day, held on April 29, will be a unique opportunity for students to visit the employer expo in the morning and interview one-on-one with companies in the afternoon. As a Cal Poly grad, I attended my first GrC Career fair over 15 years ago and was hired into the direct marketing industry even before graduating. I’m excited to introduce my colleagues to the Cal Poly “learn by doing” culture. We’ll have a room set up to conduct interviews to get to know potential candidates and discuss the positions we have available in design, sales and programming. IWCO Direct is also participating in the Senior Meet & Mingle event on April 28. We’re looking forward to networking with graduating seniors in a more relaxed setting, which will give both us and the students an opportunity to make a more personal connection and learn more about each other. We’ll have additional time to ask and answer open-ended questions, hear more about students’ backgrounds, learn about their career goals and give an overview of our company needs, benefits and open positions. IWCO Direct is unique in our industry. 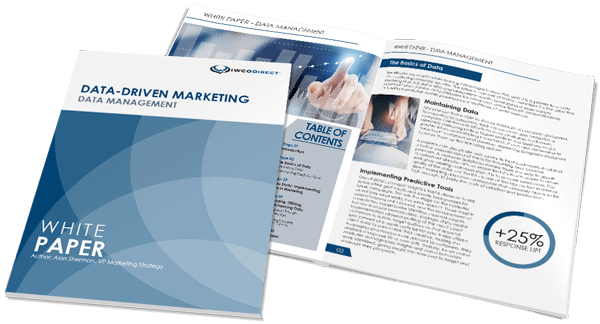 With more than 45 years in the direct marketing industry, we provide an end-to-end solution for clients who utilize direct mail as a primary channel to acquire and retain customers. At IWCO Direct you will be working on direct marketing campaigns for some of the most recognizable brands in the country. The driving force behind IWCO Direct is and has always been our people. IWCO Direct employees come from a variety of backgrounds, but all of them excel in their roles to create a productive company culture and put IWCO Direct on the map as a leading provider of direct marketing solutions. Every direct marketing professional starts somewhere, and we hope those attending the Cal Poly GrC Career Day will be excited about the prospects of heading east to join a thriving company such as IWCO Direct. I’m always really impressed by Cal Poly grads and know my colleagues will be, too. Hopefully we’ll have a chance prior to the events to tour University Graphic Systems and the Mustang News – both are fully-functioning, student-run printing companies on campus. Getting to see how the students work will help us establish a better understanding of the GrC program. It’s one of the many reasons companies come from across the country to recruit Cal Poly students. We’re looking forward to sharing our expertise and connecting with the Cal Poly Mustangs. Sales Director, National Accounts. Graphic Communications B.S. from Cal Poly San Luis Obispo with more than five years at IWCO Direct. Inspired every day by the words of her mother – “If you don’t ask, the answer is ‘no’ anyway” – she’s proudest of her marathon and triathlon medals. Commitment to the client is her favorite part of the job – but when she’s not on the job, she can be found exploring the globe, photographing, snowboarding, volunteering, and rooting for the Packers and the Cubs (a long story for a girl from Cali).